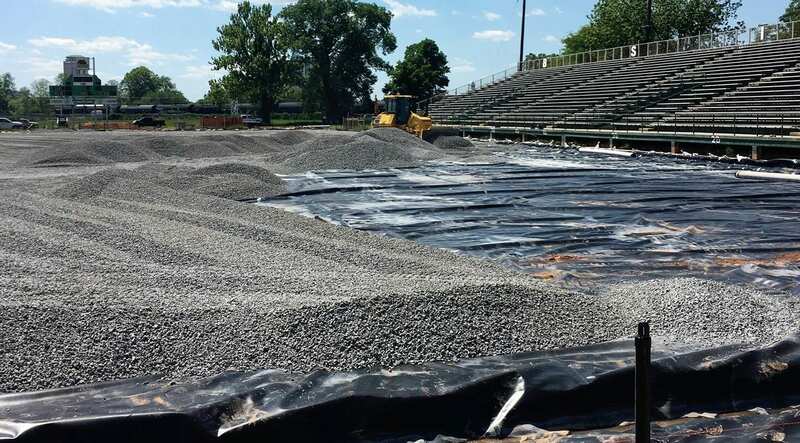 Courtesy Photo | Construction is underway on Bossier School's first artificial turf field at Bossier High School. Bossier High’s field of dreams is under construction. Crews are currently installing the district’s first artificial turf field at the Bearkat’s football stadium. The project was given the go ahead to proceed in January and officials say it will be done in plenty of time before summer practice. The turf field will be an asset to the parish as it will provide an alternate location for outdoor events. An example being the Lion’s Club annual football jamboree, which was canceled in 2016 due to poor weather and field conditions. That cancellation resulted in a loss of revenue. Last year, the Bossier Parish School Board discussed putting in artificial turf fields at four of the district’s high schools — Airline, Haughton and Parkway and Bossier. Fields for Benton and Plain Dealing were not included in the recommendation. The cost was estimated at $5.5 million for the four proposed fields. However, a vote to proceed with the project failed by a 6-6 vote. The Bossier High field was approved because of a cooperative endeavor agreement between the City of Bossier City, the Bossier Parish School Board and the Bossier Parish Police Jury. Norwood said Bossier Schools sold the building that once housed the adult learning center and life skills center to the City of Bossier City in exchange for the money that was originally dedicated to resurfacing Bossier High’s track. “The city contributed approximately two-thirds of the cost and the rest of it came from bond fund monies that we allocated for Bossier High,” Norwood said. Read more about this project in our May 2 print edition. This makes me sick!! Schools without proper classroom supplies. Teachers buying much needed items with their own money. Portable buildings full of mold instead of a classroom wing. We elected this schoolboard — seems like a direct message to unelect them!! What’s enrollment at Bossier High School down to now?